Home / How to Configure Weight-Based Packing for WooCommerce FedEx Shipping? You might have already gone through the process of configuring box packing for WooCommerce FedEx shipping. 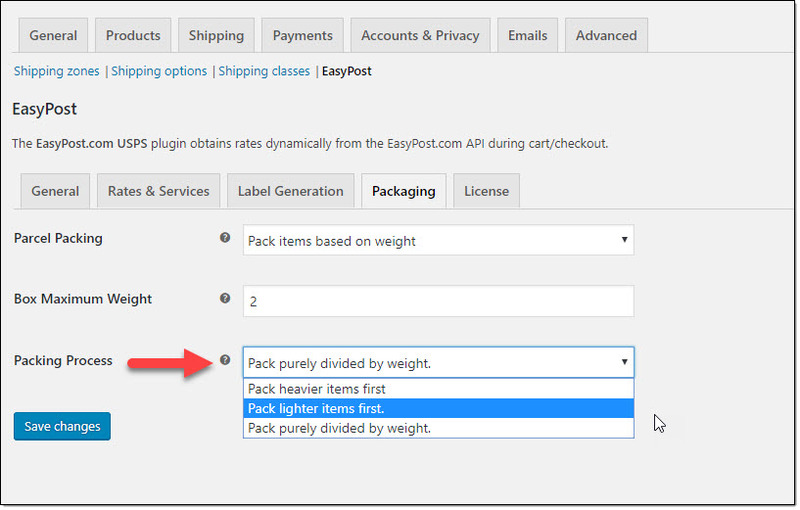 In this article, we will look into the process of setting up weight-based packing for WooCommerce FedEx Shipping. Weight based packing method will be useful when you want to pack items based only on their weight and not dimensions. You can use this method in several scenarios, where you need to pack materials in bulk purely based on weight. 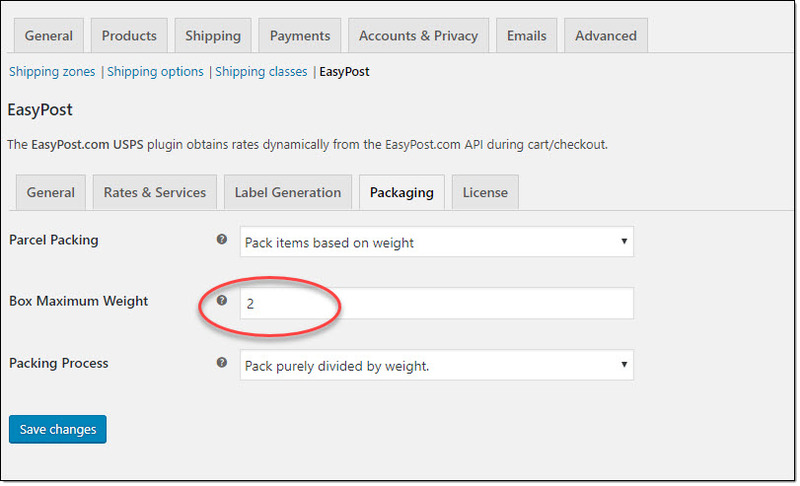 Let’s look at the process of configuring weight based packing for WooCommerce FedEx shipping. Go to WooCommerce > Settings > Shipping > EasyPost. Choose Pack items based on weight. Now, you will see the options for weight based packing. Here you can set a Box Maximum weight. Depending on your requirement, you can choose a maximum weight that will be packed into one box. For example, if you have a product with weight 2 pounds, and you define the Box Maximum weight as 10, 5 items of this product will be packed together. Also, choose the Packing Process. You will find three options. Pack heavier items first – If an order has multiple products with varied weights, the heavier items will be packed first, followed by the lighter items. Pack lighter items first – Lighter items will be packed first followed by heavier items. Pack purely divided by weight – Here items will be packed purely divided by the total weight of the order. How this will impact when a customer places an order? 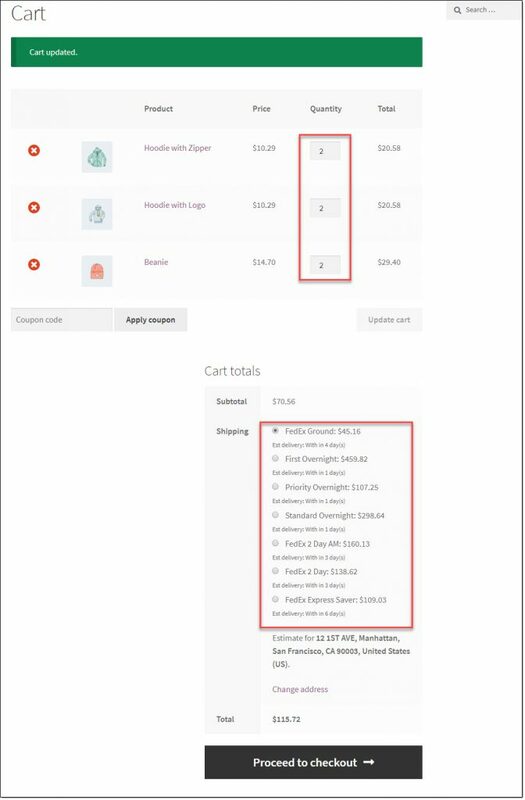 When a customer adds a combination of products to the cart, live shipping rates will be displayed according to the number of boxes required to pack all the items in the order. 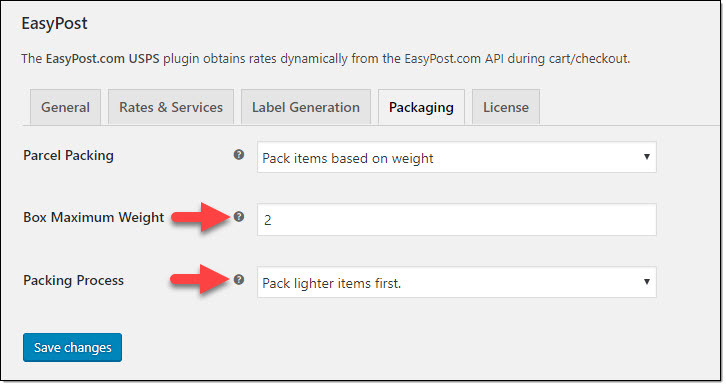 The creation of shipment too will be based on the Packing Process that you choose in the plugin settings. As box dimensions don’t matter, you can use boxes of any size to fit the products. Let us look at an example scenario. Now customers will see shipping rates according to the product weight. When an order is placed, you can generate the shipment from the order detail page. You will see the each package is created based on the weight of the product as well as the maximum box weight that you have defined. In this case, the lighter items are packed first. So the order will be Beanie, Hoodie with Zipper and then Hoodie with Logo. In the first box, 2 units of Beanie (0.5 lbs or 8 oz) is packed along with one unit of Hoodie with Zipper (1 lb or 16 oz). That box has reached the maximum capacity. In the second box, one unit of Hoodie with Zipper will be packed. Since, the third product weighs 24 oz, it won’t fit in the second box. Two more boxes will be created to accommodate 2 units of Hoodie with Logo. So total 4 boxes of maximum weight 32 oz are created. And the displayed shipping rate is according to that. 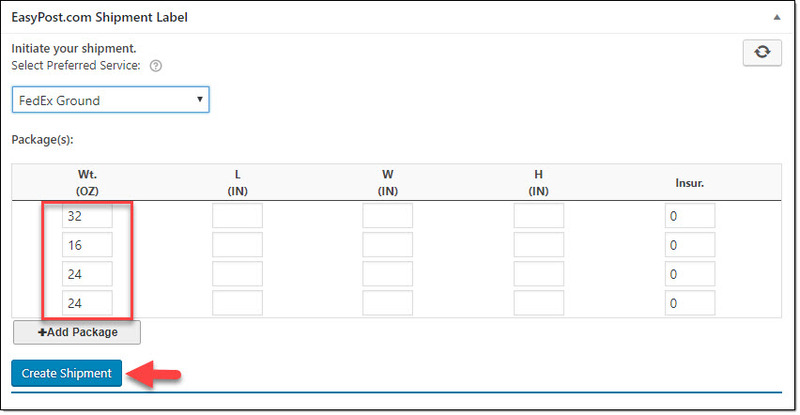 If the calculations for the shipment are correct, you can click the Create Shipment button and continue to Print the shipment label. Check the product page to understand more about the plugin features. Read our documentation to understand more about the setting up of the plugin. If you have any queries, please contact our support team.